Home / Hacking / Keyloggers / Security / Virus / Virus comes with different extensions!!! 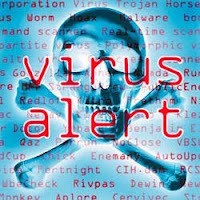 Virus comes with different extensions!!! A small mistake can indeed cause a fatal damage if not monitored at proper time,after reading this article you all will be vigilant about this.Those who are using XP os in their box must be knowing that there is a feature to hide extension of the files,this is usually disabled by default when ever we install a fresh copy of the OS.This is what i was talking about in the first line,if this is disabled so we cannot see the extension of the file we are opening and downloading therefore it becomes easier on part of the attacker to send file of undesirable extension and fool the user with ease.The file that we may be opening without knowing the extension can be a server part of a Keylogger,R.A.T(Remote Administration Tools) etc which may appear to be an image file icon or a text file icon but having .exe extension isn't it interesting...? ?.....look the image below. 1.Always keep the "hide extensions for known file types" enabled in your XP box/pc. 2.Never get driven by the icon of the file because .exe file can have the icon of an image file as shown above. 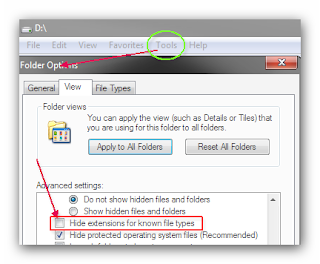 3.On keeping the "hide extensions for known file types" enabled look out for extensions like...few are listed below. there are more extensions available which are executable file extensions,to see the list (DOWNLOAD). If you fInd this article worth reading so please drop a comment!! !